Minimize unsightly spider veins, capillaries and rosacea. Removing broken capillaries, spider veins, rosacea, and telangiectasias is a quick, easy procedure that uses pulsed light therapy to target and constrict each vessel. This enables the appearance of the vessel to diminish or disappear completely. Our NaturaLight system is able to target pigment (in this case blood) in small areas and deliver a specific wavelength in pulses that affects the vessel lining. 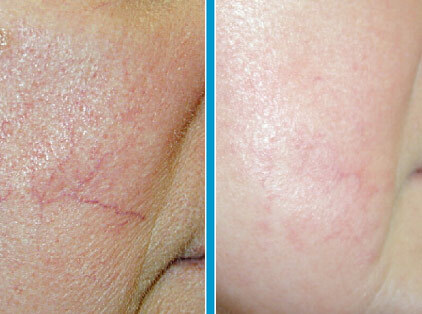 When the laser is applied, the vessels constrict and fade.